The swatch is the superhero of knitting. We asked a few friends to tell us about their love for the swatch and how it can change a knitter’s life. Today, in the second post on the subject, Andrea Rangel shares with us! “I swatch for lots of different reasons, but my main motive is to get to know my yarn. Knitting yarn into fabric tells me much more about that yarn than I could possibly find out by looking at it in the skein, feeling it, or reading the label. The fabric tells me what I want to make that yarn into. I design patterns and teach knitting as my full-time job, so you may think that how I swatch is a little too intense for you, but if you like knitting and you like playing with yarn, I think you might actually really enjoy experimenting with yarn like a designer even if you never plan to design in your life. Most weeks I knit with a new yarn, and I call this my Swatch Project. It takes me about an hour to make a six-inch(-ish) square. I observe and photograph the fabric before blocking, being sure to write down my needle size and pre-blocked gauge, and after I’ve allowed it to dry, I re-measure the gauge, take a picture, and take a video. I post all of this on Instagram so you all can enjoy it too! The swatches aren’t for anything but fun and education. I’m not trying to match my gauge to any particular project, and I’m only making one swatch regardless of the gauge I come up with. This way I get to play with yarn without making any sort of commitment. Do you have a bunch of yarn in your stash? Why not pull out a different skein each week and just swatch with it without any project planning? It’s low-stress because you’re not trying to achieve some particular goal, you’re just doing what you love to do – knit! – with yarn you picked out because you wanted it. 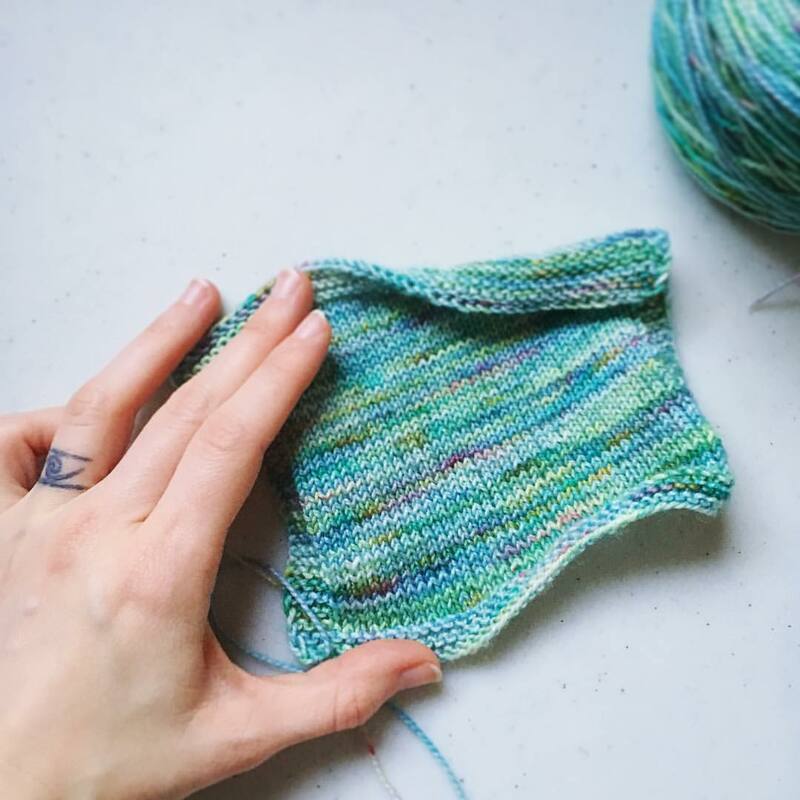 Be sure to write down your needle size & type, pre-blocked gauge, and post-blocked gauge on the label and then just put your swatch and label back in your stash with the rest of its kind. Then when you’re ready to make a project with that yarn, your first swatch is already out of the way. You may even have gotten gauge for a particular project and be able to just cast on! If you’re curious about my Swatch Project, you can follow me on Instagram and see the searchable database of swatches I’ve created on my website.